This reaches back to my "activist" days at Berkeley. I tell you, I will use any excuse to draw another toon!! This is certainly one of my best charicatures. 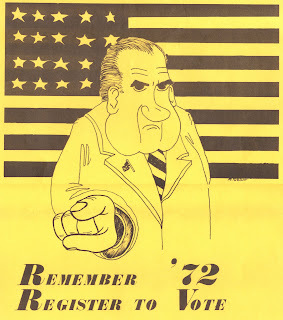 Nixon was an easy mark, though, and I think I caught his essence pretty well. Caricatures are definitely NOT my forte. I have tried to draw them a few times, with very limited success. The key is to find the character's most prominent attributes, and exaggerate them. I should try Obama's attributes. He has a lot of very distinctive facial details that would be fun to exaggerate. I will keep you posted.